Home > Groups > Adult Rex Meetup Resumes April 18th! 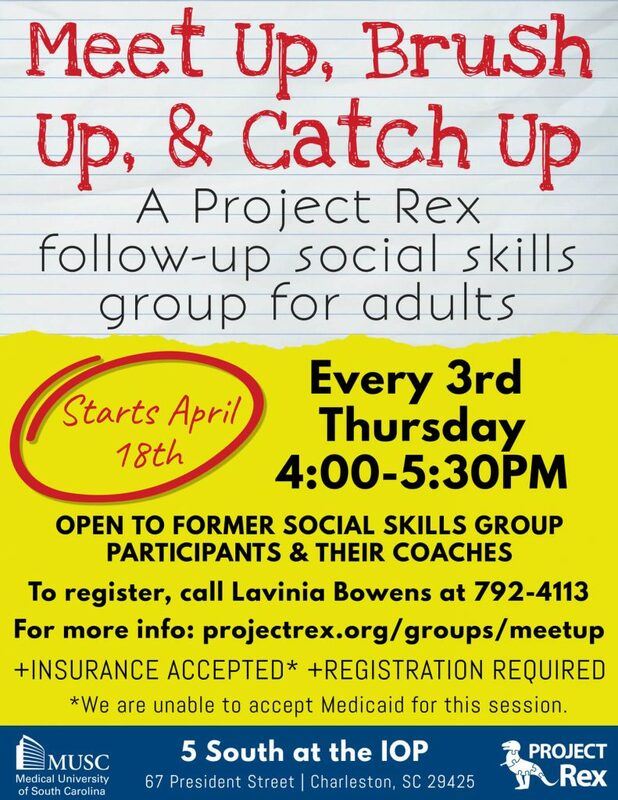 Adult Rex Meetup is meeting monthly on the 3rd Thursday of every month from 4:00PM – 5:30PM beginning April 18th, 2019. Adult Rex Meetup is an opportunity for past group members to reconnect, discuss their efforts with establishing friendships since their Rex groups, obtain a lesson refresher, and continue practicing conversation skills with one another. Meetup is open to any adult and their social skills coaches who have previously completed the 12 or 16 week Adult Rex socialization program. Adults will meet with James Truelove. Social skills coaches will meet separately with Dr. Nancy Warren. Advance registration is REQUIRED in order to attend so please call to confirm attendance before each Meetup. Contact Lavinia Bowens at 792-4113 to indicate plans to attend. At this time, we are temporarily unable to accept Medicaid for group services. We appreciate your patience and understanding as we work closely with South Carolina Medicaid to get Project Rex services covered. Project Rex is committed to serving patients with all insurance types. We also offer a self-pay option for groups. Please call Lavinia Bowens at 843-792-4113 for information about rates. Want to help spread the word? Share the flyer below on social media or obtain a printable PDF version by clicking here.